An all-in-one utility for AVI to DVD video conversion needs. This download (avi-dvd.exe) was tested thoroughly and was found 100% clean. Click "Report Spyware" link on the top if you found this software contains any form of malware, including but not limited to: spyware, viruses, trojans and backdoors. illumi AVI MPEG Converter 3.0.1 - An all-in-one utility for AVI and MPEG video conversion needs. illumi All to 3GP Converter 2.2.0 - Convert any format of video/audio files into your cell Phone! illumi All to Zune Converter 2.0.1 - Convert any format of video/audio into your Zune! illumi All to iphone Converter 2.0 - Convert any format of video/audio into your iPhone! illumi Audio Converter - an all-in-one audio conversion utility. illumi FLV to 3GP Converter 2.2.0 - Convert FLV files into your cell Phone! illumi FLV to Video Converter 3.0.1 - Convert FLV files into almost any format. 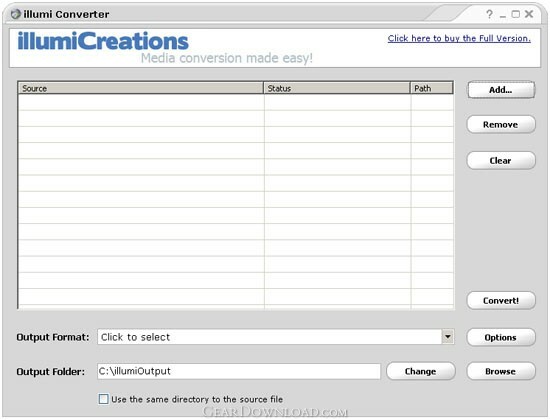 illumi Mp3 Amr Converter 2.1.7 - Convert your audios into ringtones!